This Easy Pesto Recipe can be used in many recipes. From pasta salads to pork chops, this sauce is easy to make and will add great flavor to your dishes. 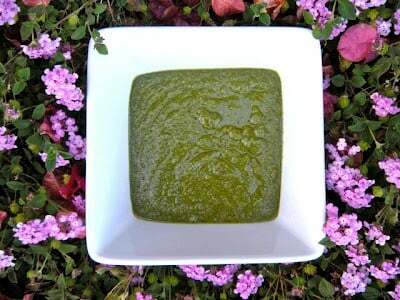 I have to be honest, up until I saw this post on the Brown Eyed Baker last year and made it for dinner, I had never had pesto. Yeah, me neither. But there’s a reason. Oh, that dressing and sun-dried tomatoes. Yeah, those little red things do it to me, too. Makes you want to go out with me to lunch, hunh? Anyway, I have avoided pesto up until this point (or rather, the night I made it last year) thinking that it would wreak some sort of havoc on my body, but I am happy to report that I can eat pesto without ANY problems! Are you still reading or have I totally lost you with discussion of my intestinal issues. Enjoy this recipe. It’s good and I made more than we needed, so I stuck it in the freezer to save for a later date. Not sure what I’ll do with it, but I do have some thoughts. And did you know there are nuts in pesto??!! I didn’t! Usually, it’s made with pine nuts, but I have to admit I love Michelle’s recipe because it’s made with walnuts which is much less expensive than pine nuts. Those babies are good, but they’re just so darned pricey! They make really awesome Pignoli Cookies though!! Oh, and I just have to share…KC from Chat n’ Dish gave and extremely nice shout out to 365 today! She talked about the blog and my baking adventure and said she really enjoyed the Blueberry Lemon Bread. Check out the video here on FoodChannel.com and you can see her make Italian Lolli-Burgers, as well! Thanks, KC! Adapted from the Brown Eyed Baker’s Basic Pesto Recipe. Place the basil, walnuts, garlic, and cheese into a blender and pulse a couple of times to mix. It will hardly mix, but don't fret. Slowly drizzle in the olive oil while the machine is still running. Scrape down the sides and around the bottom of the blender, then pulse a few more times to completely blend. This recipe makes 1 1/2 cups of Pesto. 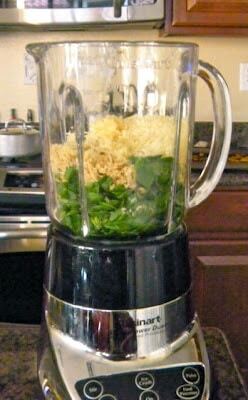 Combine the basil, walnuts, and garlic in a food processor or blender and pulse 5-7 times. Slowly drizzle in the olive oil while the machine is still running. Scrape down the sides of the blender or processor and add the cheese. Mix a few more time by pulsing to completely blend. I rate everything I make on a scale of 1-4 with 4 being the best and this Basic Pesto earned 3 1/2 rolling pins. It is so delicious over the plain pasta we had and has a “kick” to it. I’m interested now to see what the difference is in taste when using the pine nuts. An Italian classic….time to make some too! I LOVE pesto! It great on sandwiches as as spread, pizzas, salads…. on just about every thing! I heart pesto, pesto, pesto… Delicious! And homemade’s the best!